I have worked in Child Protection for more than twenty-five years. What I have observed is this: at 60 I am neither hardened nor burnt out, but more and more able to feel, be open and find enthusiasm in my work. While acknowledging that age and experience, emotional maturity, increasing skills, training and study have all contributed to this freshness, I feel clear that the impact of a daily heart-based meditation practice is the most significant factor in feeling more human and more humane. This Heartfulness practice offers both a replenishment and a clearing each day. In this work, we face a changing landscape of profound human suffering. This includes modern slavery, sexual exploitation, people trafficking and domestic violence. When I began working in Scotland, the focus was mainly on drug abuse and HIV. Now, sadly, there is a widening of the harm that human beings perpetrate on each other and children. Over time, I have observed changes in myself, from my initial harshness and judgments. 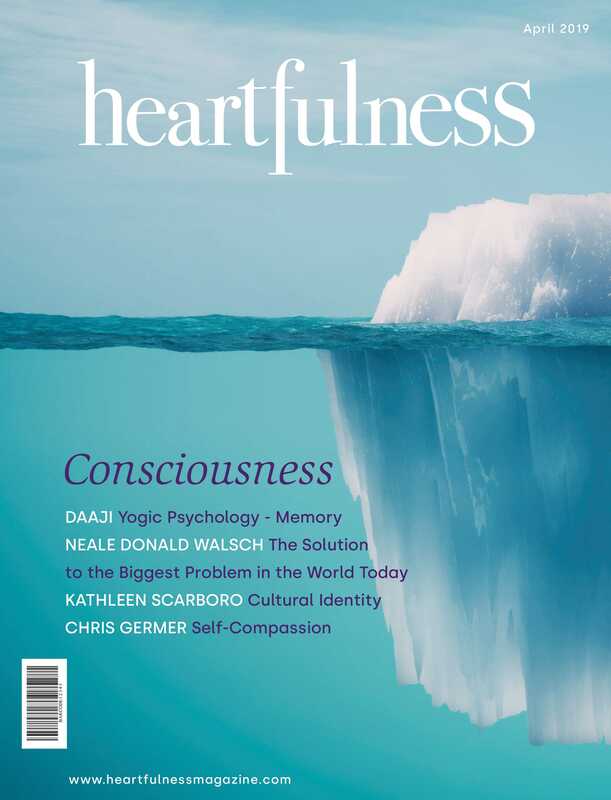 During this same period my practice of Heartfulness Meditation began and deepened. In earlier days, I was more drawn to see situations from one point of view. Now I can expand my perspectives to include all those involved. In facing the negative feelings or incompetence of other staff members, I have discovered an increasing capacity to accept everyone as they are. As a result, resentments and frustrations have disappeared. Currently, I am experiencing more absorbency in my feeling responses as well as increasing appreciation for the courage, humanity and resilience of my colleagues. Every day, work opens me to quite extreme intensities of human experiencing – both the most inspiring and the most dispiriting aspects of human existence. It involves enduring the pain of families facing removal of their children in court, and also being present at conferences where deeply distressing information is shared. There are also very moving occasions when families improve their parenting. Over time, I have learnt to surrender to the deep well of sadness and pain, and to discover more compassion for the children, parents and professionals involved. I attribute all this with gratitude to my meditation practice. In the beginning, working as a new Health Visitor in a deprived area of a large city, I faced the shocking reality of children suffering daily neglect and abuse. The strong sense of responsibility and anxiety it aroused created a feeling of urgency to act. I once stormed in with rage to resolve a situation where another colleague had appeared to have got it wrong. I was caught in a narrow tunnel of time and space in which the only possibility was a forced resolution, so that something unbearable could be stopped; a kind of breathless urge to move at all costs. Compare that to a recent situation, when a colleague from a different agency did not expedite a vital intervention. I felt myself responding to the different worlds of the people involved in this very troubled family. I had known one of the parents as a very small abused child. This poignant recognition opened a softer and deeper dimension of feeling; a more holistic dimension of understanding from my heart reaching across time. I knew of the difficulties the other parent had encountered with a series of children. I felt the difficulties of my colleague, often frustrated in this work. I found an increasing expansion of receptivity in my heart, in which past and present were alive. I could listen and take in all the different facets. There was time to meet and listen. There was a sense of expanding room and homeliness to receive everyone. There was a capacity for absorbency, a yielding softness. Such a space emerged from a deep understanding of continuing intergenerational cycles of abuse. I found myself close up to the child growing up in impossible circumstances who was now a parent. The meaning of the whole story was present in all dimensions of time and space. I could then reach out and make sure my colleague’s concerns were known and heard. Every aspect of the situation was given a place in which action could be taken to protect the child. I was able to take useful action without negative judgment. Ultimately, the protection of the child is always the fundamental focus of all efforts in my work. I sit through many conference cases of high-risk abuse, and it seems to be getting worse and worse. The young men perpetrating abuse are getting younger and are onto their second or third partners where they continue unremittingly. I hear awful details of trafficking and parents offering their children to be exploited. I can come out of such meetings with a migraine as if hit by recurrent blows. Other times I sit with those families who are waiting for a court hearing to see if their beloved children will be removed. While they would do anything for this not to happen, they do not have the capacity to change things. I feel deep sadness, wanting to weep, and holding a compassion for every one. And yet I also observe the resilience and courage of my colleagues working in this field, and the strong support they give each other, all of which inspires and moves me constantly. So what happens when I go home and try to sleep at night with the heaviness of horror stories reverberating on? Heartfulness offers a process of cleaning: removing all the impressions of the day and replenishing the system with light. It clears an inner space that is then filled with lightness and nourishment. I end that day and begin the next day lighter. In the morning I also meditate with Transmission, and find that a deeper presence hears the daily stories and helps to hold them. My heart receives daily nourishment. What a surprise to find myself at this point in my career more ready to offer a compassionate space for many different voices and lives! I feel a continuing vitality for my work. I inhabit a softer feeling space with no hard edges, in which troubles can be housed carefully and given time to make sense. Across the tension of difference among police, colleagues, social workers, health visitors, the child protection agency and families, there is a welcoming feeling of meeting and understanding. It is like being a gardener watering and tending to all the plants equally; a sheltered place with the potential for growth into the future. Many of the rough edges between myself and others have been dissolved, leaving me freer to meet all people as they are.